The new Libertarian Party just claimed that the godfather of the modern libertarian movement, Ron Paul "has no idea what the Libertarian Party represents." This week, The Free Thought Project was contacted by Michael Heise, founder of the Libertarian Party Mises Caucus who provided us with evidence that leaders within the Libertarian party have blocked Libertarian icon Ron Paul from appearing at their national convention, over comments he made about how the party needed to stick to principles instead of playing politics as usual. This past year, Heise has been on a mission to shake up the Libertarian Party and steer it back in the direction of its origins—towards the principles of peace and economic freedom that he learned from people like Ron Paul. “The LPMC has never been shy about our goal of shaking up the leadership of the party to give it a fresh look and principled direction that the majority of libertarians would be motivated to support. In fact, it is our first major milestone goal. We knew this would draw the ire of party leadership and it’s supporters. However, we feel, as most libertarians do, that it is badly needed and much overdue,” Heise said in a statement on Thursday. One of the main strategies in this plan for change is to bring advocates of the non-aggression principle and true libertarianism into positions of power and influence in the party. This includes promoting principled candidates who are running for leadership positions, as well as booking influential people to speak at conventions and libertarian events. “It is only natural that we would want to feel represented at the convention and to have a voice both on the convention floor and the stage. Nobody in leadership seems to be championing and putting issues like foreign policy, specifically the absolute humanitarian catastrophe in Yemen, blockchain solutions to statist problems and the Federal Reserve fraud on the forefront!” Heise said. “We found success in this pursuit after connecting Jim Cantrell, part of the founding team for SpaceX, and CEO of Vector Space Systems, with Daniel Hayes, the chair of the LP’s convention committee,” he added. 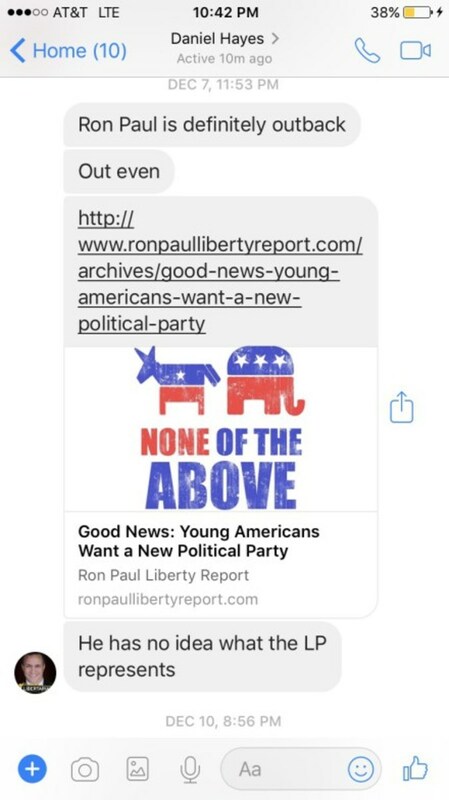 Hayes linked an article titled “Good News: Young Americans Want a New Political Party” that Ron Paul wrote where he was slightly critical of the direction that the LP was headed, as proof that he had no idea what they represented. Perhaps it is the Libertarian Party that does not understand Libertarian Values. 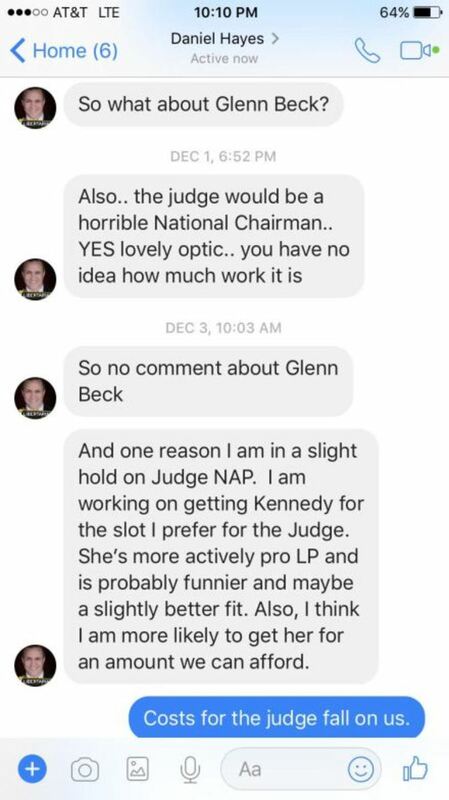 In further dialogue between Heise and Hayes, Hayes said that Judge Napolitano “would make a terrible chairman” and suggested Neocon Glen Beck as a potential speaker instead. Heise says that the party is likely trying to avoid criticism over the change in direction that they have taken in recent years to appeal more to liberals and conservatives, and his assumptions were later confirmed when LP Chairman Nicholas Sarwark was questioned on Twitter about the party’s rejection of Paul at the convention. “We all know very well that this isn’t actually about Ron Paul, it’s about what he represents. 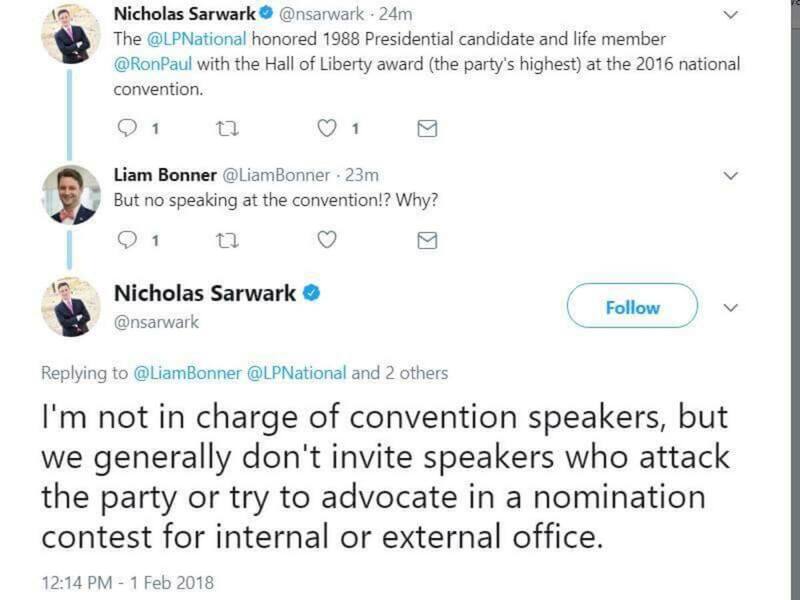 This member of the Libertarian National Committee would rather hold a grudge over legitimate criticism than let Dr. Paul speak, just like the Republican Party tried to do to him. This type of pettiness is why this caucus (Mises) exists,” Heise said. It seems that the libertarian party has been co-opted with people who want to water down the radical principles of freedom that have been at the core of the libertarian brand for centuries, well before the existence of the US Libertarian political party.